The opening round of the season in Melbourne produced few technical upgrades, although most of what was brought to the final test session was intended for the opening races of 2015. Whilst we can expect a few more bits for Malaysia, this Technical Highlights post runs through a couple of the larger developments from the teams from the final Barcelona test and the minor detail changes made for Australia. Melbourne confirmed what we realistically knew was going to occur for this year – another season of dominance. The W06 looked better than every car out there even on Friday, when both drivers were struggling with the setup. Their advantage is to the tune of ~1.3s over a single lap and about 0.7s per lap in a race situation. For all we know they could have turned down the power unit for the race on Sunday! As far as upgrades, the Silver Arrows had a subtle change to the nose which tapers more aggressively up to the specified point 150mm forward of the front wheel centreline before cutting diagonally downwards to meet the front bulkhead. The new shape encourages air passing along the side of the nose to duck underneath, head towards the splitter section and work the floor a little harder. Although Red Bull already run the stub/short-tip nose, rumour is that they are producing one in the Williams form factor to increase overall downforce. However this nose was not present in Australia as apparently it failed its crash test just before the race weekend. The stubbed noses are harder to pass the crash tests as they have a much shorter crumple zone to dissipate energy so expect nose developments to come around about China, if not Spain. A late development to the RB11 in testing is this continuous leading edge rear wing endplate slot (red), which connects the horizontal louvres above the wing planes with the vertical slot at the front of the ‘plate by the rear tyre. As individual components, these slots act as pressure equalisers at their respective positions on the endplate: the horizontal louvres reduce the pressure gradient at the wing tips for better management of the vortices the wing sheds at speed, and the vertical slot cleans up turbulence generated by the rotating rear tyre. Joined together, however, offers a better pressure distribution across the entire endplate rather than at localised points. 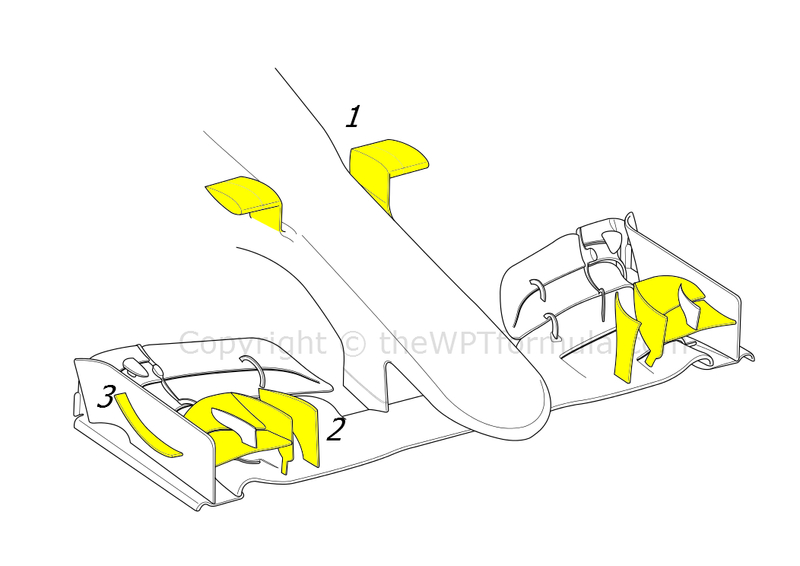 This will have some implications on how the car produces its upwash effect at the rear but the main purpose of doing this conjoined slot is to reduce drag rather than gain downforce. It will be interesting to see if this catches on across the grid. New since testing were some minor revisions to the front wing flaps. The upper-most flap has been cut more aggressively downards at the inboard region and the sixth element at the outboard edge of the wing now spans across it entirely. This adjustment is aimed at finetuning the Y250 vortex and increasing the efficiency of the wing at low/medium speed. Finally, the small flick-up vane behind the cascade winglets has been split into two elements for more precise management of airflow. Lotus are still adjusting to life with Mercedes power, which – combined with a decent aerodynamic overhaul on the new E23 – means it could be a while before results from the new partnership come about. Having run most of testing with botched bodywork in some minor areas, the complete rear brake duct assembly will have been a welcome gain for the team in Australia. Not only will this have improved brake temperature management but also some additional downforce downforce applied directly to the rear tyre. The best thing about the start of the new season is that we finally get to see some pictures of the cars in the pitlane without bodywork on – there are no hoardings for the teams to hide behind! 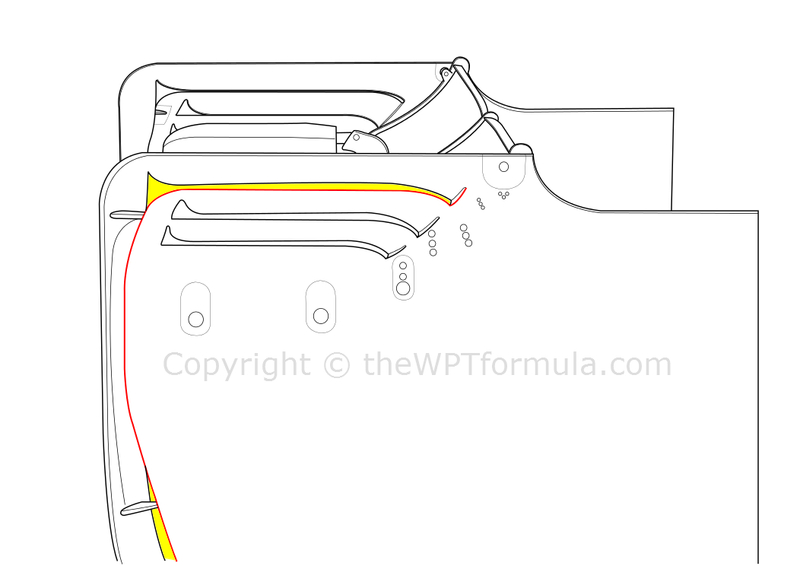 We already knew that Williams and Force India were more than likely to retain their air-to-air intercooler (IC) layout from 2014 and Lotus have also followed this pathway for this year. I still find it pretty interesting that Mercedes are the only one to use an air-to-water IC of all the supplied teams. The renewed McLaren-Honda continues to disappoint (for now), although their aero programme is beginning to show a few signs of improvement. A number of new bits appeared across the MP4-30 including a neat pair of under-chassis vanes. These vanes are often updated to tweak the position of the Y250 vortex and manage airflow passing underneath the nose, so they have a profound effect on linking the front and rear aero structures. The new vanes have three curled elements, with upturned slots to entice airflow through them. Work on the radically different front wing continued in Australia with plenty of flo-vis runs carried out during free practice. Both Jenson Button and Kevin Magnussen tried two options, one with extended cascades and revised upper flaps, the other without (i.e. the testing wing). At the rear the central rear wing has been extended through the engine cover and down onto the top of the gearbox case, effectively forming a Y-lon arrangement. Although this is heavier it will provide better structural stiffness to the rear wing and prevent unwanted flexing. Seeing Ferrari near the top of the speed trap figures is a welcome change over their miserable 2014. Certainly the power unit is a major step in the right direction and the fact that Sauber are also up in the points despite only a few changes to their chassis justifies this. A new front wing was brought to the final test, which they continue to use into the beginning of the season. James Allison’s design influence is starting to really show in this area whilst they have also borrowed a few design ideas from Mercedes. The nose camera pods (1) are not as curved as the original test item following an FIA directive to make these more “minimal” for 2015. Instead they form a vertical stalk and a nicely formed dog-leg onto the nose to manage airflow over the top of the chassis. Having produced their own unique solution of the past few years, the cascade winglets (2) have stepped towards what most of the field is using today – a twin element winglet accompanied by and r-shaped vane to turn airflow around the front tyre. Also like other teams, a curved pressure gradient vane (3) has been placed on the wing’s endplate to generate a low pressure region behind and draw airflow from out behind the wing elements. This is not a very efficient way of producing downforce but it will help the outwash of airflow at the front of the car, which can be combined with the effect of the blown front axle.